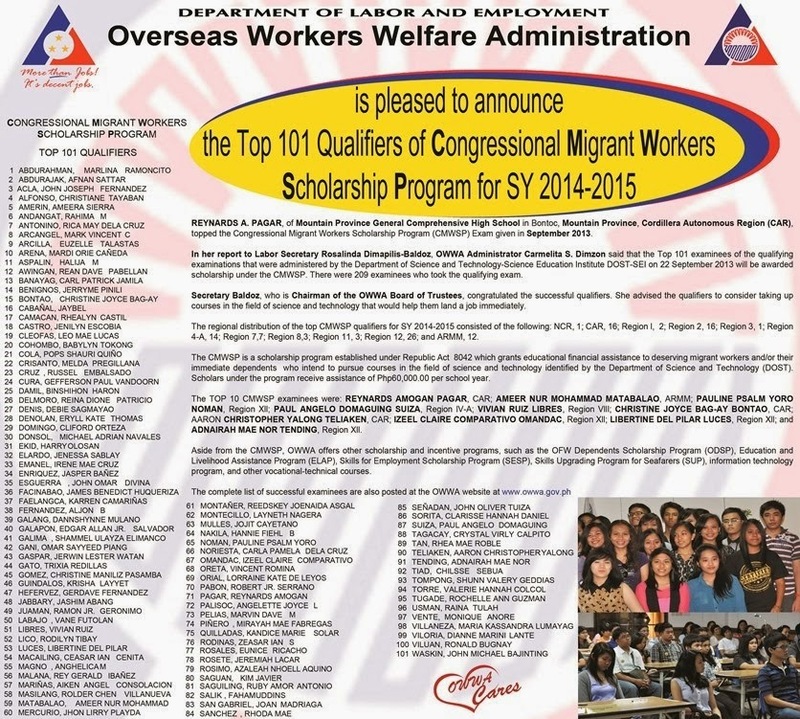 Manila, Philippines - The Department of Labor and Employment (DOLE) and the Overseas Workers Welfare Administration (OWWA) released results of Congressional Migrant Workers Scholarship Program (CMWSP) for School Year SY 2014-2015. REYNARDS A. PAGAR, of Mountain Province General Comprehensive High School in Bontoc, Mountain Province, Cordillera Autonomous Region (CAR), topped the Congressional Migrant Workers Scholarship Program (CMWSP) Exam given in September 2013. In her report to Labor Secretary Rosalinda Dimapilis-Baldoz, OWWA Administrator Carmelita S. Dimzon said that the Top 101 examinees of the qualifying examinations that were administered by the Department of Science and Technology-Science Education Institute DOST-SEI on 22 September 2013 will be awarded scholarship under the CMWSP. There were 209 examinees who took the qualifying exam. Secretary Baldoz, who is Chairman of the OWWA Board of Trustees, congratulated the successful qualifiers. She advised the qualifiers to consider taking up courses in the field of science and technology that would help them land a job immediately. The regional distribution of the top CMWSP qualifiers for SY 2014-2015 consisted of the following: NCR, 1; CAR, 16; Region l, 2; Region 2, 16; Region 3, 1; Region 4-A, 14; Region 7,7; Region 8,3; Region 11, 3; Region 12, 26; and ARMM, 12. The CMWSP is a scholarship program established under Republic Act 8042 which grants educational financial assistance to deserving migrant workers and/or their immediate dependents who intend to pursue courses in the field of science and technology identified by the Department of Science and Technology (DOST). Scholars under the program receive assistance of Php60,000.00 per school year. The TOP 10 CMWSP Scholars for 2013 are: REYNARDS AMOGAN PAGAR, CAR; AMEER NUR MOHAMMAD MATABALAO, ARMM; PAULINE PSALM YORO NOMAN, Region Xll; PAUL ANGELO DOMAGUING SUIZA, Region lV-A; VIVIAN RUIZ LIBRES, Region Vlll; CHRISTINE JOYCE BAG-AY BONTAO, CAR; AARON CHRISTOPHER YALONG TELIAKEN, CAR; IZEEL CLAIRE COMPARATIVO OMANDAC, Region Xll; LIBERTINE DEL PILAR LUCES, Region Xll; and ADNAIRAH MAE NOR TENDING, Region Xll. Aside from the CMWSP, OWWA offers other scholarship and incentive programs, such as the OFW Dependents Scholarship Program (ODSP), Education and Livelihood Assistance Program (ELAP), Skills for Employment Scholarship Program (SESP), Skills Upgrading Program for Seafarers (SUP), information technology program, and other vocational-technical courses.